Information, in the context of scholarly articles by research at universities and think-tanks, is not a zero sum game. In other words, one person cannot have more without having someone have less. When you start creating “Berlin” walls in the information arena within the halls of learning, then learning itself is compromised. In fact, contributing or granting the intellectual estate into the creative commons serves a higher purpose in society – an access to information and hence, a feedback mechanism that ultimately enhances the value to the end-product itself. How? Since now the product has been distributed across a broader and diverse audience, and it is open to further critical analyses. The universities have built a racket. They have deployed a Chinese wall between learning in a cloistered environment and the world who are not immediate participants. The Guardian wrote an interesting article on this matter and a very apt quote puts it all together. 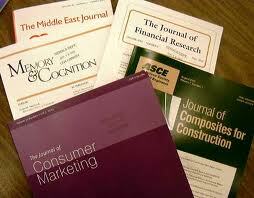 “Academics not only provide the raw material, but also do the graft of the editing. What’s more, they typically do so without extra pay or even recognition – thanks to blind peer review. The publishers then bill the universities, to the tune of 10% of their block grants, for the privilege of accessing the fruits of their researchers’ toil. The individual academic is denied any hope of reaching an audience beyond university walls, and can even be barred from looking over their own published paper if their university does not stump up for the particular subscription in question. 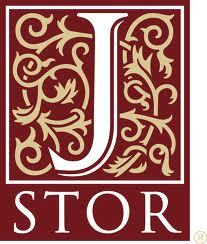 JSTOR is a not-for-profit organization that has invested heavily in providing an online system for archiving, accessing, and searching digitized copies of over 1,000 academic journals. More recently, I noticed some effort on their part to allow public access to only 3 articles over a period of 21 days. This stinks! This policy reflects an intellectual snobbery beyond Himalayan proportions. 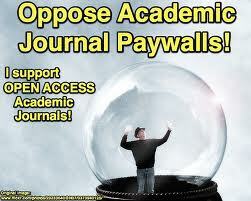 The only folks that have access to these academic journals and studies are professors, and researchers that are affiliated with a university and university libraries. Aaron Swartz noted the injustice of hoarding such knowledge and tried to distribute a significant proportion of JSTOR’s archive through one or more file-sharing sites. And what happened thereafter was perhaps one of the biggest misapplication of justice. The same justice that disallows asymmetry of information in Wall Street is being deployed to preserve the asymmetry of information at the halls of learning. And then there were some modest reservations, and Swartz actions were attributed to reckless judgment. 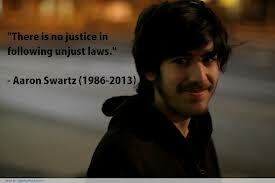 I contend that this does injustice to someone of Swartz’s commitment and intellect … the recklessness was his inability to grasp the notion that an imbecile in the system would pursue 35 years of imprisonment and $1M fine … it was not that he was not aware of what he was doing but he believed, as does many, that scholarly academic research should be available as a free for all. We have a Berlin wall that needs to be taken down. Swartz started that but he was unable to keep at it. It is important to not rest in this endeavor and that everyone ought to actively petition their local congressman to push bills that will allow open access to these academic articles. John Maynard Keynes had warned of the folly of “shutting off the sun and the stars because they do not pay a dividend”, because what is at stake here is the reach of the light of learning. Aaron was at the vanguard leading that movement, and we should persevere to become those points of light that will enable JSTOR to disseminate the information that they guard so unreservedly. Posted on March 29, 2013, in Corporate Social Responsibility, Innovation, Learning Organization, Learning Process, Order, Ovation, Risk Management, Social Causes, Social Dynamics, Vision and tagged creativity, crowdsource, democracy, diversity, experiments, learning organization, mass psychology, meaning, strategy. Bookmark the permalink. Leave a comment.